The US says only around 4% of the chemical weapons declared by the Syrian government has been removed. Defence Secretary Chuck Hagel said he was "concerned" that the UN-backed plan to remove Syria's chemical arsenal was behind schedule. Mr Hagel told reporters in Poland that Damascus "had to take responsibility for fulfilling its commitment". Delegates from Syria's government and opposition have attended peace talks in Geneva for a sixth day. UN mediator Lakhdar Brahimi told reporters that there had been both tense and promising moments. He said a minute's silence was held by the delegations on Thursday for all those killed in the conflict, which began in March 2011. In a separate development, a report from Human Rights Watch has accused the Syrian government of "deliberately and unlawfully" demolishing thousands of homes in opposition strongholds. The organisation said this was "collective punishment of communities suspected of supporting the rebellion". Media captionChuck Hagel: "The Syrian government has to take responsibility"
Syria's chemical weapon stockpiles are due to be removed and destroyed by 30 June. Chuck Hagel's comments regarding the painfully slow efforts on the part of the Syrian government to dispose of its chemical weapons stockpiles should not come as a surprise to anyone. He said he did not know why the process was so far behind schedule, but, regardless, President Bashar al-Assad's government "need to fix this". White House spokesman Jay Carney, a world away from Warsaw, told reporters something very similar: "We expect them to meet their obligations." Syria has said it possesses about 700 tonnes of deadly chemicals and 500 tonnes of precursor chemicals, the kind that become toxic when combined with other compounds. Almost all 1,200 tonnes were supposed to be removed by 5 February. Mr Hagel said he had asked the Russian defence minister to try to influence the Syrian government to comply with the agreement. The first consignment of 16 tonnes, from two Syrian sites, left the port of Latakia on 7 January. A further shipment left on 27 January, according to the Organisation for the Prohibition of Chemical Weapons (OPCW). The international watchdog, which is overseeing the destruction of Syria's chemical arsenal, is meeting in The Hague to discuss the operation's progress. That meeting is likely to continue into Friday given "the gravity of the situation," a spokesman told the BBC. In a statement to the OPCW, the US ambassador to the body, Robert Mikulak, said "the effort to remove chemical agent and key precursor chemicals from Syria has seriously languished and stalled". "The spotlight now is on Syria to proceed without further delay to comply with its obligations and make this effort a success," he added. Under the terms of the UN-backed plan to destroy Syria's arsenal, the Syrian authorities are responsible for packing and safely transporting the chemical weapons to the Mediterranean port of Latakia. 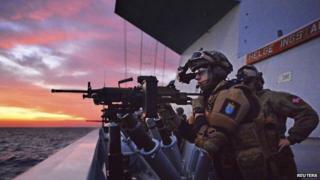 Denmark and Norway are providing cargo ships and military escorts to take them to Italy, where they will be loaded onto a US Maritime Administration cargo ship, MV Cape Ray. The materials will be destroyed in international waters. More than 100,000 people have been killed since the uprising in Syria began. US believes arsenal can be "delivered by aircraft, ballistic missile, and artillery rockets"
Millions of Syrians have fled the violence and are living in refugee camps in neighbouring countries. The current round of peace negotiations in Geneva is scheduled to end on Friday. The UN envoy Lakhdar Brahimi has said he hopes for more progress in next week's second round of talks between the two sides. Both sides stood together in silence on Thursday to remember those who had died, he confirmed. "The opposition suggested a minute of silence for all the dead in Syria, irrelevant of which camp they belong [to] and the government delegation immediately agreed and we had that minute of silence," he told reporters. The agreement to remove Syria's chemical weapons followed an attack in Damascus on 21 August 2013 in which hundreds of people were killed. The United Nations concluded that the deadly nerve gas sarin had been used. Inspectors also found that chemical weapons were "probably used" at a further four sites in Syria. The Syrian government denies using chemical weapons, saying the attack was carried out by rebel fighters. But the chief UN investigator said in an interview published on Thursday that the Syrian government had failed to explain how the rebel fighters might have obtained and delivered sarin. Ake Sellstrom told the specialist publication CBRNe World that Syrian officials had "quite poor theories". "If they really want to blame the opposition they should have a good story as to how they got hold of the munitions, and they didn't take the chance to deliver that story," he said.